L to R: Bob Hasegawa, Zack Hudgins. Photos courtesy http://www.leg.wa.gov. 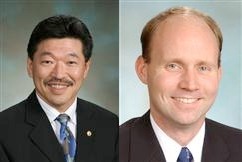 At 6 p.m. on Thursday, April 19, 11th District State Representatives Bob Hasegawa and Zack Hudgins will host a telephone town hall meeting for constituents to bring up any questions, comments, and concerns about legislative and other issues. The 11th District includes parts of South Seattle including the western part of Beacon Hill, Georgetown, Burien, Sea-Tac, Tukwila, and part of Renton. Residents of the 11th District should get a telephone call around 6 p.m. to join the town hall. Once connected, constituents may ask questions by pressing *3 on the telephone.